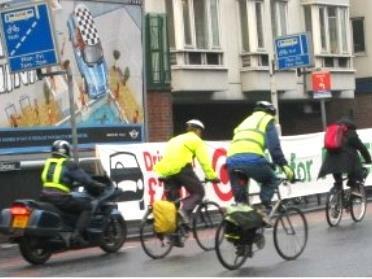 The decision to open bus lanes to motorcycles has sparked ‘fury’ according to the London Cycling Campaign (LCC). But the group fails to come up with anyone angry except its own chief executive. LCC boasted of handing Boris Johnson a petition with 3,500 names asking him to reconsider, but faced humiliation when 3,900 MCN readers signed our petition urging the Mayor to press ahead. The group claims there is ‘no clear evidence it’s safe’ to let us use bus lanes, even though collisions for all road users fell 42% on three routes where the measure was trialed. LCC points to a TfL report which says the fall is not significant, but ignores accusations leveled at former Mayor Ken Livingstone of pressuring researchers into manipulating findings. But the only angry comment is from LCC’s chief executive Koy Thomson. He claims: ‘There has been no attempt to assess the impact of this measure across London for all street users,’ ignoring the three-year trial on key routes. MCN called LCC to discuss its campaign but was told its spokesman was “too busy” to speak to us.